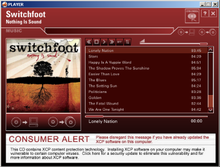 Screenshot of the Sony CD audio player, playing Switchfoot's fifth studio album Nothing Is Sound. Note the message on the bottom telling the consumers to update XCP, claiming it will "eliminate this vulnerability". A scandal erupted in 2005 regarding Sony BMG's implementation of deceptive, illegal, and harmful copy protection measures on about 22 million CDs. When inserted into a computer, the CDs installed one of two pieces of software which provided a form of digital rights management (DRM) by modifying the operating system to interfere with CD copying. Neither program could easily be uninstalled, and they created vulnerabilities that were exploited by unrelated malware. Sony claims this was unintentional. One of the programs installed, even if the user refused its end-user license agreement (EULA), would still "phone home" with reports on the user's private listening habits; the other was not mentioned in the EULA at all, contained code from several pieces of copylefted free software in an apparent infringement of copyright, and configured the operating system to hide the software's existence, leading to both programs being classified as rootkits. In August 2000, statements by Sony Pictures Entertainment US senior VP Steve Heckler foreshadowed the events of late 2005. Heckler told attendees at the Americas Conference on Information Systems "The industry will take whatever steps it needs to protect itself and protect its revenue streams... It will not lose that revenue stream, no matter what... Sony is going to take aggressive steps to stop this. We will develop technology that transcends the individual user. We will firewall Napster at source – we will block it at your cable company. We will block it at your phone company. We will block it at your ISP. We will firewall it at your PC... These strategies are being aggressively pursued because there is simply too much at stake." In Europe, BMG created a minor scandal in 2001 when it released Natalie Imbruglia's second album, White Lilies Island, without warning labels stating that the CD had copy protection. The CDs were eventually replaced. BMG and Sony both released copy-protected versions of certain releases in certain markets in late 2001, and a late 2002 report indicated that all BMG CDs sold in Europe would have some form of copy protection. The two pieces of copy-protection software at issue in the 2005–2007 scandal were included on over 22 million CDs marketed by Sony BMG, the record company formed by the 2004 merger of Sony and BMG's recorded music divisions. About two million of those CDs, spanning 52 titles, contained First 4 Internet (F4I)'s Extended Copy Protection (XCP), which was installed on Microsoft Windows systems after the user accepted the EULA which made no mention of the software. The remaining 20 million CDs, spanning 50 titles, contained SunnComm's MediaMax CD-3, which was installed on either Microsoft Windows or Mac OS X systems after the user was presented with the EULA, regardless of whether the user accepted it (although Mac OS X prompted the user for confirmation when the software sought to modify the OS). The scandal erupted on October 31, 2005, when Winternals (later acquired by Microsoft) researcher Mark Russinovich posted to his blog a detailed description and technical analysis of F4I's XCP software that he ascertained had been recently installed on his computer by a Sony BMG music CD. Russinovich compared the software to a rootkit due to its surreptitious installation and its efforts to hide its existence. He noted that the EULA does not mention the software, and he asserted emphatically that the software is illegitimate and that digital rights management had "gone too far". Anti-virus firm F-Secure concurred: "Although the software isn't directly malicious, the used rootkit hiding techniques are exactly the same used by malicious software to hide themselves. The DRM software will cause many similar false alarms with all AV software that detect rootkits. ... Thus it is very inappropriate for commercial software to use these techniques." After public pressure, Symantec and other anti-virus vendors included detection for the rootkit in their products as well, and Microsoft announced it would include detection and removal capabilities in its security patches. It creates security holes that can be exploited by malicious software such as worms or viruses. It constantly runs in the background and excessively consumes system resources, slowing down the user's computer, regardless of whether there is a protected CD playing. It employs unsafe procedures to start and stop, which could lead to system crashes. It has no uninstaller, and is installed in such a way that inexpert attempts to uninstall it can lead to the operating system to fail to recognize existing drives. Soon after Russinovich's first post, there were several trojans and worms exploiting XCP's security holes. Some people even used the vulnerabilities to cheat in online games. On November 18, 2005, Sony BMG provided a "new and improved" removal tool to remove the rootkit component of XCP from affected Microsoft Windows computers. On November 15, 2005 vnunet.com announced that Sony BMG was backing out of its copy-protection software, recalling unsold CDs from all stores, and offering consumers to exchange their CDs with versions lacking the software. The Electronic Frontier Foundation compiled a partial list of CDs with XCP. Sony BMG was quoted as maintaining that "there were no security risks associated with the anti-piracy technology", despite numerous virus and malware reports. On November 16, 2005, US-CERT, part of the United States Department of Homeland Security, issued an advisory on XCP DRM. They said that XCP uses rootkit technology to hide certain files from the computer user, and that this technique is a security threat to computer users. They also said one of the uninstallation options provided by Sony BMG introduces further vulnerabilities to a system. US-CERT advised, "Do not install software from sources that you do not expect to contain software, such as an audio CD." Sony BMG announced that it had instructed retailers to remove any unsold music discs containing the software from their shelves. It was estimated by internet security expert Dan Kaminsky that XCP was in use on more than 500,000 networks. CDs with XCP technology can be identified by the letters "XCP" printed on the back cover of the jewel case for the CD according to SonyBMG's XCP FAQ. On November 18, 2005 Reuters reported that Sony BMG would exchange affected insecure CDs for new unprotected disks as well as unprotected MP3 files. Information about the swap can be found at the Sony BMG swap program website. As a part of the swap program, consumers can mail their XCP-protected CDs to Sony BMG and be sent an unprotected disc via return mail. On November 29 then New York Attorney General Eliot Spitzer found through his investigators that, despite the recall of November 15, Sony BMG CDs with XCP were still for sale in New York City music retail outlets. Spitzer said "It is unacceptable that more than three weeks after this serious vulnerability was revealed, these same CDs are still on shelves, during the busiest shopping days of the year, [and] I strongly urge all retailers to heed the warnings issued about these products, pull them from distribution immediately, and ship them back to Sony." The next day, Massachusetts Attorney General Tom Reilly issued a statement saying that Sony BMG CDs with XCP were still available in Boston despite the Sony BMG recall of November 15. Attorney General Reilly advised consumers not to purchase the Sony BMG CDs with XCP and said that he was conducting an investigation of Sony BMG. As of May 11, 2006 Sony BMG's website offered consumers a link to "Class Action Settlement Information Regarding XCP And MediaMax Content Protection." It has online claim filing and links to software updates/uninstallers. The deadline for submitting a claim was June 30, 2007. As of April 2, 2008 Sony BMG's website finally offered consumers their explanation and list of affected CDs. On November 21, 2005, Texas Attorney General Greg Abbott sued Sony BMG. Texas was the first state in the United States to bring legal action against Sony BMG in response to the rootkit. The suit was also the first filed under the state’s 2005 spyware law. It alleged that the company surreptitiously installed the spyware on millions of compact music discs (CDs) that consumers inserted into their computers when they play the CDs, which can compromise the systems. On December 21, 2005, Abbott added new allegations to his lawsuit against Sony-BMG, regarding MediaMax. The new allegations claimed that MediaMax violated the state's spyware and deceptive trade practices laws, because the MediaMax software would be installed on a computer even if the user declined the license agreement that would authorize its installation. Abbott stated, "We keep discovering additional methods Sony used to deceive Texas consumers who thought they were simply buying music", and "Thousands of Texans are now potential victims of this deceptive game Sony played with consumers for its own purposes." In addition to violations of the Consumer Protection Against Computer Spyware Act of 2005, which allowed for civil penalties of $100,000 for each violation of the law, the alleged violations added in the updated lawsuit (on December 21, 2005) carried maximum penalties of $20,000 per violation. Sony lost the battle with Abbott and had to pay $750,000 in legal fees to Texas, accept customer returns of affected CDs, place a conspicuous detailed notice on their homepage and make "keyword buys" to alert consumers by advertising with Google, Yahoo! and MSN, pay up to $150 per damaged computer, and much more. Sony BMG also had to agree that they would not make any claim that the legal settlement in any way constitutes the approval of the court. Class action suits were filed against Sony BMG in New York and California. On December 30, 2005, the New York Times reported that Sony BMG had reached a tentative settlement of the lawsuits, proposing two ways of compensating consumers who have purchased the affected recordings. According to the proposed settlement, those who purchased an XCP CD will be paid $7.50 per purchased recording and given the opportunity to download a free album, or be able to download three additional albums from a limited list of recordings if they give up their cash incentive. District Judge Naomi Reice Buchwald entered an order tentatively approving the settlement on January 6, 2006. The settlement is designed to compensate those whose computers were infected, but not otherwise damaged. Those who have damages that are not addressed in the class action are able to opt out of the settlement and pursue their own litigation. A fairness hearing was held on May 22, 2006 at 9:15 am at the Daniel Patrick Moynihan United States Courthouse for the Southern District of New York. Claims had to be submitted by December 31, 2006. Class members who wished to be excluded from the settlement must have filed before May 1, 2006. Those who remained in the settlement could attend the fairness hearing at their own expense and speak on their own behalf or be represented by an attorney. In Italy, ALCEI (an association similar to EFF) also reported the rootkit to the Financial Police, asking for an investigation under various computer crime allegations, along with a technical analysis of the rootkit. The US Department of Justice (DOJ) made no comment on whether it would take any criminal action against Sony. However, Stewart Baker of the Department of Homeland Security publicly admonished Sony, stating, "it's your intellectual property—it's not your computer". On November 21, the EFF announced that it was also pursuing a lawsuit over both XCP and the SunnComm MediaMax DRM technology. The EFF lawsuit also involves issues concerning the Sony BMG end user license agreement. It was reported on December 24, 2005 that then-Florida Attorney General Charlie Crist was investigating Sony BMG spyware. On January 30, 2007, the U.S. Federal Trade Commission (FTC) announced a settlement with Sony BMG on charges that their CD copy protection had violated Federal law—Section 5(a) of the Federal Trade Commission Act, 15 USC 45(a)—by engaging in unfair and deceptive business practices. The settlement requires Sony BMG to reimburse consumers up to $150 to repair damage that resulted directly from their attempts to remove the software installed without their consent. The settlement also requires them to provide clear and prominent disclosure on the packaging of future CDs of any limits on copying or restrictions on the use of playback devices, and ban the company from installing content protection software without obtaining consumers’ authorization. FTC chairwoman Deborah Platt Majoras added that, "Installations of secret software that create security risks are intrusive and unlawful. Consumers' computers belong to them, and companies must adequately disclose unexpected limitations on the customer use of their products so consumers can make informed decisions regarding whether to purchase and install that content." Researchers found that Sony BMG and the makers of XCP also apparently infringed copyright by failing to adhere to the licensing requirements of various pieces of free and open-source software whose code was used in the program, including the LAME MP3 encoder, mpglib, FAAC, id3lib, mpg123 and the VLC media player. In January 2006, the developers of LAME posted an open letter stating that they expected "appropriate action" by Sony BMG, but that the developers had no plans to investigate or take action over the apparent violation of LAME's source code license. Russinovich's report was being discussed on popular blogs almost immediately following its release. NPR was one of the first major news outlets to report on the scandal on November 4, 2005. Thomas Hesse, Sony BMG's Global Digital Business President, told reporter Neda Ulaby, "Most people, I think, don't even know what a rootkit is, so why should they care about it?" In November 7, 2005 article, vnunet.com summarised Russinovich's findings, and urged consumers to avoid buying Sony BMG music CDs for the time being. The following day, The Boston Globe classified the software as spyware and Computer Associates' eTrust Security Management unit VP Steve Curry confirmed that it communicates personal information from consumers' computers to Sony BMG (namely the CD being played and the user's IP address). The methods used by the software to avoid detection were likened to those used by data thieves. On November 8, 2005, Computer Associates decided to classify Sony BMG's software as "spyware" and provide tools for its removal. Speaking about Sony BMG suspending the use of XCP, independent researcher Mark Russinovich said, "This is a step they should have taken immediately." The first virus which made use of Sony BMG's stealth technology to make malicious files invisible to both the user and anti-virus programs surfaced on November 10, 2005. One day later Yahoo! News announced that Sony BMG had suspended further distribution of the controversial technology. According to ZDNet News: "The latest risk is from an uninstaller program distributed by SunnComm Technologies, a company that provides copy protection on other Sony BMG releases." The uninstall program obeys commands sent to it allowing others "to take control of PCs where the uninstaller has been used." On December 6, 2005, Sony BMG said that 5.7 million CDs spanning 27 titles were shipped with MediaMax 5 software. The company announced the availability of a new software patch to prevent a potential security breach in consumers' computers. Sony BMG in Australia released a press release indicating that no Sony BMG titles manufactured in Australia have copy protection. ^ Anastasi, Michael A. "Sony Exec: We Will Beat Napster," New Yorkers For Fair Use web site, August 17, 2000. Retrieved November 13, 2006. ^ a b Borland, John (2001-11-19). "Customers put kibosh on anti-copy CD". CNET. Retrieved 2009-08-24. ^ Fox, Barry (2001-10-02). "NSync CD is copy protection "experiment"". New Scientist. Retrieved 2009-08-24. ^ Rohde, Laura (2001-09-27). "Sony: Downbeat for a new online music battle". IDG. Retrieved 2009-09-26. On Tuesday, Sony confirmed that it had incorporated copy-protection software in promotional CD copies of the Michael Jackson single "You Rock My World. ^ Lettice, John (2002-11-06). "'No more music CDs without copy protection,' claims BMG unit". The Register. Retrieved 2009-08-24. ^ a b c "Sony BMG Litigation Info". 1 July 2011. ^ "Anti-Piracy CD Problems Vex Sony", BBC News. Retrieved November 22, 2006. ^ Russinovich, Mark (2005-10-31). "Sony, Rootkits and Digital Rights Management Gone Too Far". Mark's Blog. Microsoft MSDN. Retrieved 2009-07-29. ^ "SecurityRisk.First4DRM", Symantec Security Response, November 2005. Retrieved November 22, 2006. ^ "Sony's DRM Rootkit: The Real Story", Schneier On Security, November 17, 2005. Retrieved November 22, 2006. ^ "Viruses use Sony anti-piracy CDs", BBC News, 2005-11-11. ^ "World of Warcraft hackers using Sony BMG rootkit". ^ "Information about XCP protected CDs". 2007-10-17. Archived from the original on 2007-10-17. Retrieved 2011-06-20. ^ "More on Sony: Dangerous Decloaking Patch, EULAs and Phoning Home", Mark's Blog, November 4, 2005. Retrieved November 22, 2006. ^ Nikki, Matti. "Muzzy's research about Sony's XCP DRM system" Archived November 24, 2005, at the Wayback Machine, December 6, 2005. Retrieved June 21, 2014. ^ vunet.com (2005-11-15). "Sony backs out of rootkit anti-piracy scheme". Archived from the original on 2005-11-24. ^ "Updated Sony BMG DRM Spotter's Guide | Electronic Frontier Foundation". Eff.org. 2005-11-08. Retrieved 2011-10-22. ^ Taylor, Paul. "Sony BMG bows to pressure", Financial Times, November 17, 2005. Retrieved November 22, 2006. ^ "More pain for Sony over CD code", BBC News, November 17, 2005. Retrieved November 22, 2006. ^ "SonyBMG's XCP FAQ". Archived from the original on 2009-01-30. ^ Hesseldahl, Arik. " Spitzer Gets on Sony BMG's Case " Archived 2005-12-01 at the Wayback Machine, BusinessWeek Online, November 29, 2005. Retrieved November 22, 2006. ^ "Office of the Attorney General". Ago.state.ma.us. Retrieved 2010-08-22. ^ "Information Web Site for the Sony BMG CD Technologies Settlement". 2006-12-21. Archived from the original on 2006-12-21. Retrieved 2011-06-20. ^ "CD's Containing XCP Content Protection Technology". Archived from the original on October 12, 2007. Retrieved 2008-12-24. ^ "Texas Attorney General". Oag.state.tx.us. 2005-11-21. Retrieved 2010-08-22. ^ "Texas Attorney General". Oag.state.tx.us. Retrieved 2010-08-22. ^ Dallas Business Journal (December 21, 2005). "dallas.bizjournals.com". dallas.bizjournals.com. Retrieved 2011-06-20. ^ San Antonio Business Journal (December 22, 2005). "sanantonio.bizjournals.com". sanantonio.bizjournals.com. Retrieved 2011-06-20. ^ "Texas Attorney General" (PDF). texasattorneygeneral.gov. Retrieved 2006-12-19. ^ Menta, Richard. Bush Administration to Sony: It's your intellectual property -- it's not your computer. November 12, 2005. ^ "Crist's office joins Sony BMG spyware probe", St. Petersburg Times Online, December 24, 2005. Retrieved November 22, 2006. ^ a b c "Sony BMG Settles FTC Charges". Federal Trade Commission. January 30, 2007. Retrieved 2007-06-20. ^ "DOCKET NO. C-4195: COMPLAINT; In the Matter of SONY BMG MUSIC ENTERTAINMENT, a general partnership" (PDF). June 29, 2007. Retrieved 2012-01-08. ^ "Sony BMG Settles FTC "Rootkit" Charges". ConsumerAffairs.Com. January 31, 2007. Archived from the original on September 29, 2007. Retrieved 2007-06-20. ^ "CD's [sic] Containing XCP Content Protection Technology". Sony BMG Music Entertainment. 2005. Archived from the original on 2008-10-06. Retrieved 2012-04-17. ^ Hocevar), sam@zoy.org (Sam. "Sam Hocevar's .plan". sam.zoy.org. ^ "LAME LAME Ain't an MP3 Encoder". lame.sourceforge.net. ^ "Sony CD's caught installing extremely well-hidden and sketchy DRM software". WFMU blog. 2005-11-01. ^ "Sony Music CDs Under Fire from Privacy Advocates". NPR. 2005-11-04. Retrieved 2011-06-20. ^ Bray, Hiawatha. "Security firm: Sony CDs secretly install spyware", The Boston Globe, November 8, 2005. Retrieved November 22, 2006. ^ Turner, Suzi (2005-11-08). "CA Targets Sony DRM as Spyware". ZDNet. Retrieved 2010-08-19. ^ "Microsoft to remove Sony CD code; Sony's controversial anti-piracy CD software has been labelled as spyware by Microsoft. ", BBC News, November 14, 2005. Retrieved November 22, 2006. ^ Halderman, J. Alex "Not Again! Uninstaller for Other Sony DRM Also Opens Huge Security Hole", Freedom to Tinker, November 17, 2005. Retrieved November 22, 2006. ^ "No Copy Protection on Australian Sony BMG CDs". Retrieved 18 January 2007. Bergstein, Brian (2005-11-18). "Copy protection an experiment in progress"[dead link]. Seattlepi.com. Halderman, J. Alex, and Felten, Edward. "Lessons from the Sony CD DRM Episode" (PDF format), Center for Information Technology Policy, Department of Computer Science, Princeton University, 2006-02-14. "Sony anti-customer technology roundup and time-line", Boing Boing.